After completing my training in Paediatric Cardiology at SJD Barcelona Children’s Hospital, I went to gain experience at the Cardiac Intensive Care Unit of Royal Brompton Hospital in London (United Kingdom), one of the biggest in Europe in this speciality. The following year I started working at Leeds General Infirmary (Leeds, United Kingdom), where I started my career as a consultant in the Paediatric Cardiology Department. 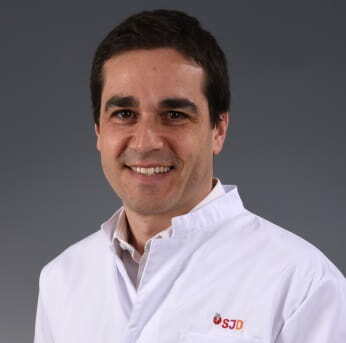 During this period, I developed a great interest in advanced imaging and I completed a six-month fellowship at Great Ormond Street Hospital in London (United Kingdom), where I learnt how to conduct cardiac magnetic resonance studies and which I started to apply in Leeds before returning to Barcelona to continue this sub-speciality at Sant Joan de Deu since 2014. Fellowship in cardiac magnetic resonance at Great Ormond Street Hospital in London, 2013. Fellowship in the Cardiac ICU at Royal Brompton and Harefield Hospital in London, 2011 - 2012. Master’s degree in Paediatric Cardiology from the University of Barcelona (UB) at SJD Barcelona Children’s Hospital, Barcelona 2009 - 2011. Paediatric residency in Hospital Parc Taulí, Sabadell, Barcelona, 2004 - 2008. Degree in Medicine and Surgery from the Autonomous University of Barcelona, 1995 - 2001. Grant from the Daniel Bravo Foundation. Sojourn in Boston Children’s Hospital for a research project, 2018 - 2019. Consultant in the Cardiology Department in Leeds (UK), 2012 - 2014. Fellow in cardiac magnetic resonance at Great Ormond Street Hospital in London, 2013. Online course in cardiac magnetic resonance, published by CTO Editorial. Author of the chapter relating to the Study of Congenital Heart Diseases.